Description: The stems of Sisyrinchium bellum can grow as long as 60 cm (24 in), though they are often shorter. The flowers are 1–2 cm (0.39–0.79 in) in diameter and purplish-blue, varying somewhat in color from a true blue to a definite purple; occasional white-flowering plants are found. It flowers from. Dried in air, its seeds weigh between 1 and 4 mg. After flowering, it dies to the ground and is dormant over the summer. Leaf: Its leaves are grassy and tufted. 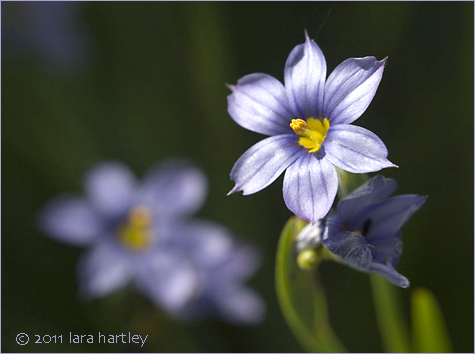 Notes: Sisyrinchium bellum, a monocot, is a perennial herb that is native to California and is also found outside of California, but is confined to western North America. Horticulture: S. bellum prefers some moisture and good drainage, but will tolerate summer dryness. It can be propagated by seed, and it self-sows. It can also be propagated by division of its rhizomes, and the flower stems can be rooted. It is moderately hardy and will tolerate temperatures down to 20 degrees F.